Standard ISO 5667 applies to drinking water sampling. No specific sampling method is required as these will be grab samples in all cases. ISO standards describe the various sampling techniques, types of containers to be used and methods applicable to sample preservation according to the parameter to be analysed. lake water (natural or artificial): use ballasted flasks (with mobile frame, check valves …) specially designed to take samples in deep water. It should be noted that this apparatus can also be used in plant (e.g. collecting a sludge bed sample). Every attempt should be made to collect the sample from the future pumping location. When a multiple intake tower is used, collect samples from different levels in order to establish the lake or reservoir physical-chemical profile and algology and to provide the operator with guidance on selecting the intake level. Once again, sampling campaigns must be repeated for different seasons in order to highlight stratification or circulation periods, eutrophication trends. tap (well, plant, mains): let the water run to flush the sampling line until the piping capacity has been totally renewed and the water quality stabilized. If possible, sampling taps for a raw or undertreated water should be left open to continuously flush the sampling line. In most cases, plastic flasks can be used. However, glass flasks are recommended for some parameters. Flasks should be clean and single use is preferred. The easiest solution consists of asking the laboratory performing the analysis to provide the flasks adapted to the analysis required (including the necessary preservatives). Samples for drinking water bacteriological analysis should be collected in sterile flasks containing sodium thiosulphate to neutralise chlorine. These flasks should only be opened at the time of sampling. with flasks containing additives (acid …), make sure not to overflow when filling and again it is unnecessary to fill the flask to the rim. When collecting wastewater samples, ISO standard 5667-10 applies. Given the variable nature of a wastewater effluent composite or proportional sampling is typically required. With wastewater treatment applications, all mass balance must be proportional to the flow rate. 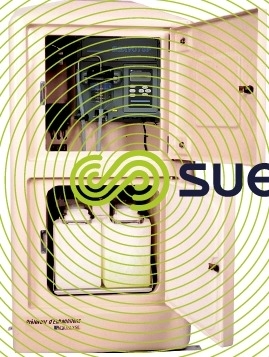 In most cases, this requires some equipment to be installed such as mobile or fixed automatic samplers. watertight submersible housing for portable equipment. For fixed apparatus, the casing that stores the samples must be cooled down to 4°C. 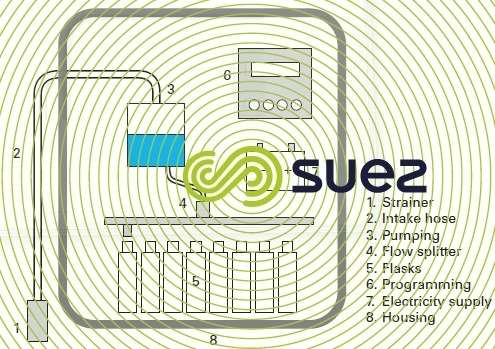 When the plant is equipped with flowmeters, each sampler should be controlled by the appropriate flowmeter. 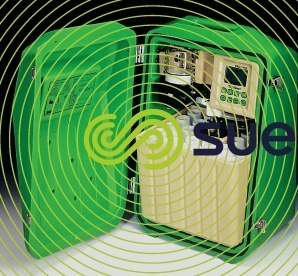 If a flow meter connection is unavailable, samples should be collected in proportion to time (e.g. one sample every 15 minutes and four samples per flask for a sampler that has 24 flasks). A test tube is then used to reconstitute a sample that would be proportional to the flow rate based on lift pump or endless screw operating records (the minimum requirement is pump operating records hour-by-hour). The selection of a proper sampling point is fundamental to ensure sample representativity. With fixed samplers, it is recommended to carry out a review of the system practical details (ease of access during sampling, electricity supply close by) before selecting the safest and most convenient location for manual or automatic sample collection. In a wastewater treatment plant, properly selecting the sampling point for the raw water is essential. The sampling location should be positioned before all returns to the plant headworks and within a zone of high turbulence (homogenous stream).